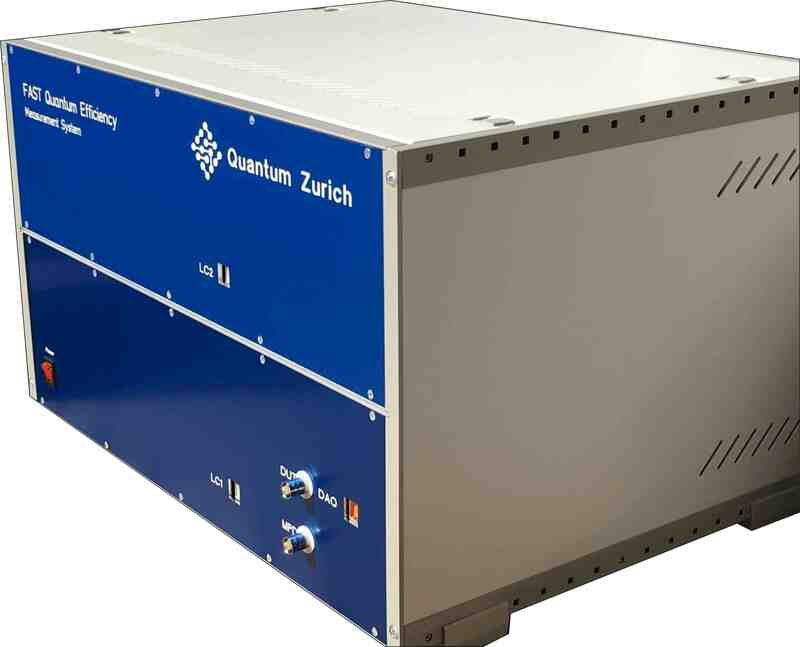 for its "FAST Quantum Efficiency Measurement System"
the Commission for Technology and Innovation (CTI) of the Swiss Confederation. the Laboratory for Thin Films and Photovoltaics at EMPA (Switzerland). Save time. Save work. Save costs. 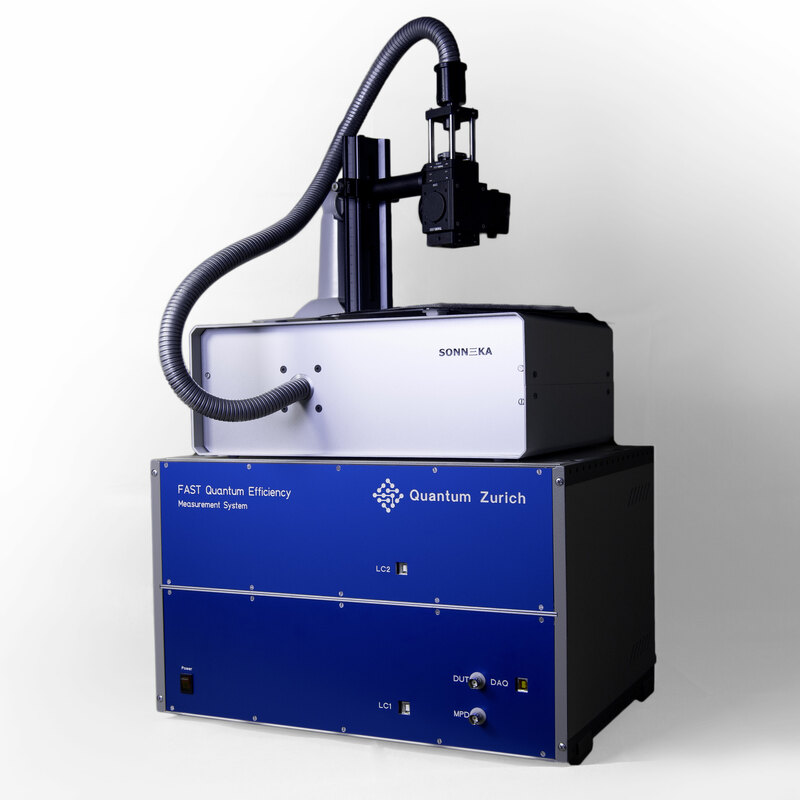 The FAST Quantum Efficiency measurement system provides high-speed operation. 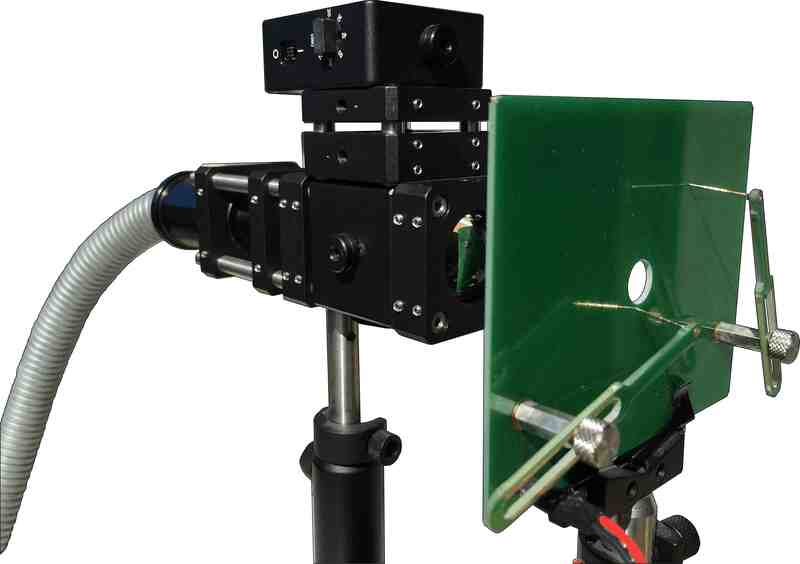 As a result, the system is capable of performing a single measurement in only 8 seconds, independent of the wavelength range covered by the measurement. This is up to 99% faster than traditional systems. 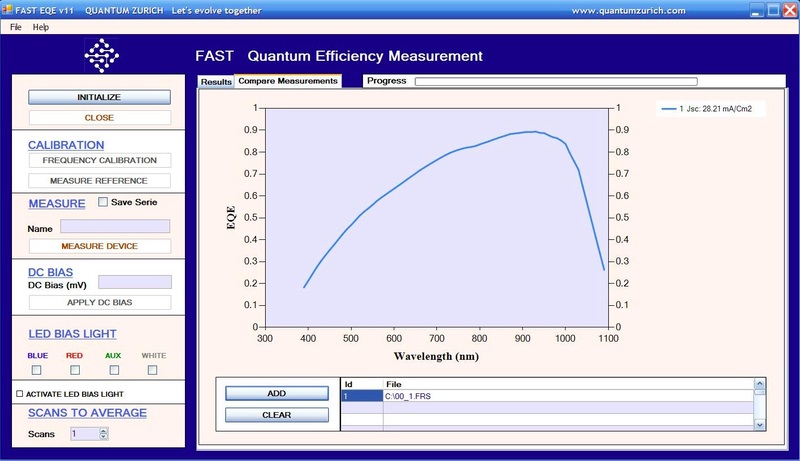 The FAST Quantum Efficiency measurement system is commanded by a graphical user interface that allows the user to measure the quantum efficiency very FAST, in a simple CLICK, without the need to set any parameters. The FAST Quantum Efficiency measurement system is delivered with a laptop with the instrument control software preinstalled. The system is ready to be used after the different parts are connected. Phone and e-mail technical support is available during setup and qualification. You receive unlimited downloads of the graphical user interface, including free updates. Every purchase includes 1 year warranty for electronic parts and labour on defects in material and workmanship, including worldwide return shipping. This system has a flexible head (FLEX-HEAD) that makes its incorporation in systematized processes easy and possible. Easily adaptable. Easy to integrate in your automatized measurement and control system. Ready to implement in your daily measurements. It is also small in size, allowing quick and easy installation in any manufacturing line. The FAST Quantum Efficiency measurement system provides high-speed operation. 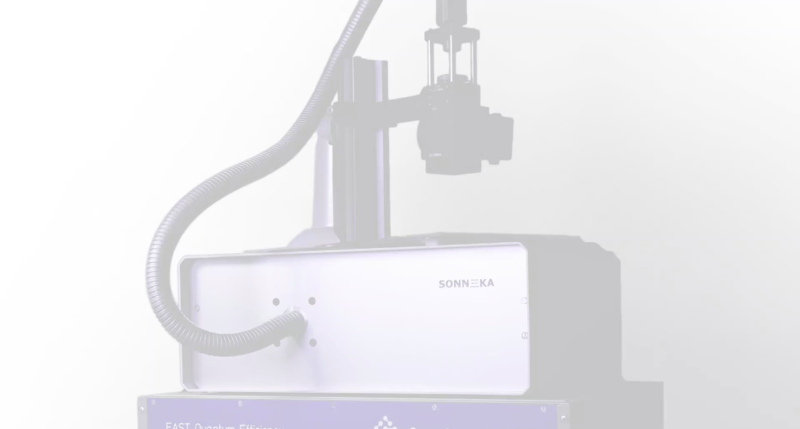 As a result, the system is capable of performing a single measurement in only 8 seconds, which has to be compared with the nearly 10 minutes necessary to perform the same measurement with a traditional monochromator based system. Furthermore this result is independent of the wavelength range covered by the measurement. 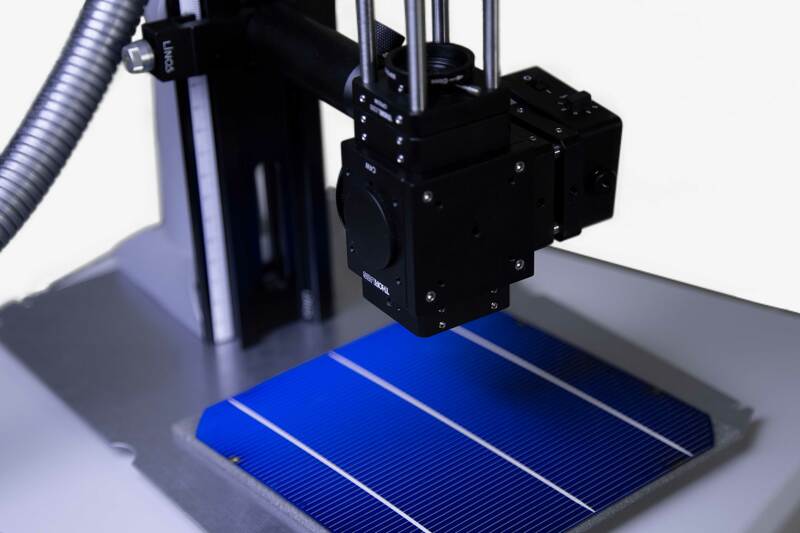 The FAST Quantum Efficiency measurement system can be used as a useful tool to perform very fast analysis of the quantum efficiency of solar cells using a high throughput fabrication process, as well as to evaluate the homogeneity and reproducibility of the fabrication process of solar cells in large systems. This is a system made to rocket up solar cell manufacturing R & D projects. Quantum Efficiency measurements no longer cause bottlenecks, making fast analysis of a large amount of solar cells possible for researchers for the first time. The use of solid-state Light Emitting Diodes (LED) technology as a light source is well known for its excellent long-term stability and quiet operation. It eliminates maintenance thanks to the absence of mobile parts inside the system and the long lifetime of the LED-based light source (typically > 10000 h). Additionally, it has lower energy consumption and is smaller in size, it has no health hazards and it is simple to install. The FAST Quantum Efficiency measurement system provides high-speed operation and excellent long-term stability. The high speed operation results from the parallel driving of a set of Light Emitting Diodes (LEDs) and the subsequent analysis of the signal by Fourier Transform techniques. A series of 40 LEDs with a wavelength ranging from 350 nm to 1100 nm are simultaneously driven at different frequencies, the electrical signal induced by each photon at the solar cell is then amplified and analysed as a whole to extract the quantum efficiency by a FAST Fourier analysis. Click & Measure: the FAST Quantum Efficiency measurement system is commanded by a graphical user interface that allows the user to measure the quantum efficiency FAST, with only a simple CLICK: "measure device", without the need to set any parameters. Comparing data: the graphical user interface also allows the user to compare, in-situ and in a very simple and fast way, the quantum efficiency of multiple saved data. Repeatability: the above figure shows the result of five measurements of the quantum efficiency performed on the same device. The excellent reproducibility of the system allows to appreciate small differences between the quantum efficiency of different devices. 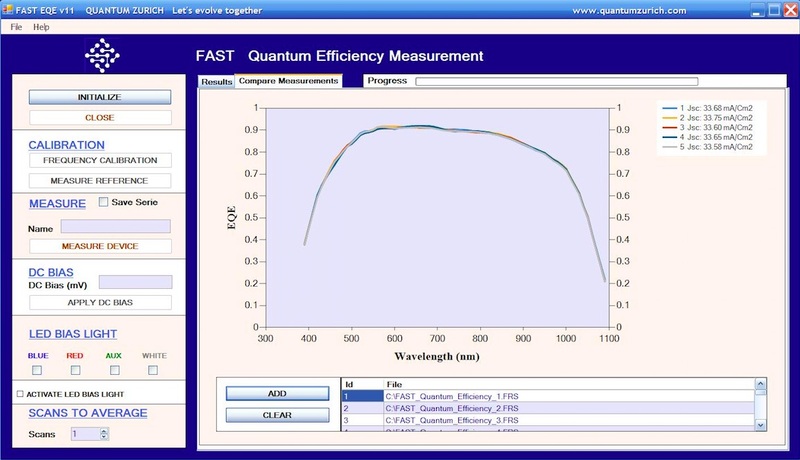 The FAST Quantum Efficiency measurement system consists of the following parts: 1) the electronic system, which is capable of driven individually each LED of the source light as well as the high power LEDs of the bias light, 2) the optical system, which allows the light to be focused into an external optical fiber cable, 3) the optical head, which is formed by a beam splitter and a photodetector to monitor the intensity of light that is captured by the solar cell, and 4) the measurement chuck. All is commanded, via USB, by a specific software with a graphical user interface. The flexible optical fiber cable and the optical head (FLEX-HEAD) can be positioned in whatever orientation, in both horizontal and vertical configurations, to be easily adapted to customised measurement setups. 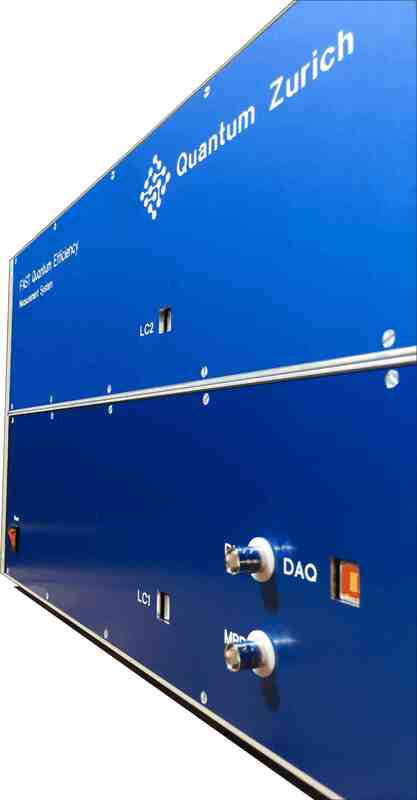 The FAST Quantum Efficiency measurement system is delivered with a simple and versatile measurement chuck which allows solar cells to be measured in all configurations. The contacting probes consist of spring-loaded pins placed on a support, without wiring and with in-plane 360º mobility, which allows the probes to be positioned on the device in a confortable way. The user can also use their own measurement probes without any modification of the system.